Here’s Chapter 1 of the recently published The Key with Hearts, available now on Amazon. The little dog nosed along the edge of the bricked planters. His white tail wagged, excitement quivering through his whole body. He sniffed at every speck, whether dirt or leaf or twig. Brightly colored ribbons, tied tightly together to create a long leash, trailed over his back and the terrace’s paving stones. His sniffing increased. He growled. His short nose swept across the slate-colored pavers. He retreated several steps as he tracked the scent, then followed it back to the grass. The clipped grass tickled his nose. He strained against the ribbon leash as he dug at the stones, as if the pavers were the edge of a cairn hiding a vicious rodent. Then his head popped up. Ears pricked forward. Dark eyes stared at the high hedge with its thick branches of boxwoods. He glanced behind him at the woman holding one end of his tether. They had ended their walk by traversing the maze. Throughout their tour of the garden, she seemed distracted, barely attending to his tugs on the leash. Now her gaze focused on the drive that swept from the parkland. The gravel turned into a gentle curve as it approached the manor’s forecourt. The little terrier sniffed the air. Then he lunged forward. The leash held him back. He strained against it then lunged again, but his paws didn’t find grass beneath him. His claws scrabbled on the pavers. He barked. Sparky whined. Incidents with the Gardener meant running and digging, shouts and a game of chase that left him lying on cool grass, panting to cool off, and being carried back to the house by his mistress. He pranced back, his white patches gleaming against the brown and tan. She drew in the ribbon leash. When he pawed at her day gown, she picked him up and snuggled him close. Sparky wiggled. He wanted down. He tolerated her snuggles, but he wanted to explore and dig and sniff out new adventures. Beth felt the same way. Yet like Sparky, she often found herself restricted to the great manor, her activity confined to a Sparky-less stroll through the garden and maze, her curiosity limited to learning the people of Myers Buckland and the village beyond. She had assumed none of the duties expected of the wife of the lord of the manor, not even pouring tea when the local families came to visit. The Myers hosted dinners for people she barely knew, people who watched her with avid eyes. Her adventures were staid rounds of visits to the sick and needy of the estate, monitored by her husband’s sisters who reported to their mother, a great lady who refused to call herself the dowager. Beth sighed into Sparky’s coat. “I am bored,” she whispered to the little terrier. He wiggled about, trying to give kisses then settled for licking her hand. And Beth stared again at the long drive with its neat edging. When she’d come out with Sparky, a gardener had raked the gravel disturbed when her husband rode to the village of Wellesborne Buckland. The gardener had ignored her and continued until he removed the last trace of her husband Greville Myers’ passage. The whole estate was like that. Beth understood the need for everything in its place. Her own home, equal in size to the Myers Buckland manor, had followed a strict routine and returned anything displaced immediately to its proper position. On her rounds carrying food and medicines to anyone sick or enfeebled, she saw well-tended fences, neat pastures and fields, which pleased her. The garden itself, allowed to decay at the fringes, had spent the summer months being restored. Her husband had needed the marriage settlements she brought with her. He plowed the money back into the manor and estate. She had expected evidence of years of mismanagement, but only roofs and a few buildings needed obvious repairs. On the day she reached the estate, a month after their marriage, with her arrival announced by a note she sent the day previous, he hadn’t greeted her, leaving that to his mother and sister. He had been mucked up with repairs to an irrigation weir that had failed. Beth understood the demands of an estate. Without him there as the bridge, though, greeting his mother and sisters had quelled her spirit. Their stiff welcome was no more than any visitor would have received. Six months married, and she still barely knew her husband. She was five months in residence at the manor and still felt like a visitor. “How long will everyone stare at me, Sparky?” Were they waiting for the wealthy but decidedly middle-class bride to prove they should continue to look down their noses at her? The terrier wiggled and squirmed. Beth set him down. He bit the leash, but the hastily tied ribbons withstood his sharp teeth. Busily biting a red ribbon, he ignored her, and Beth laughed at her silliness. She’d woken with a maudlin displacement. Something was wrong at Myers Buckland. Was that something her? To prevent another Incident with Mr. Potts, she had tied the leash and brought Sparky outside to escape her in-laws. After spending two hours listening to Mrs. Myers describe in detail her plans for the upcoming fête to the sycophantic Lydia Pethbridge, another hour spent helping Cassandra select silks for a petit-point chair cover, and Clarissa mulling over her watercolors, Beth needed the fresh air and sunshine. His tail wagged at the promised treat. Beth crossed her arms. Lifting her face to the warm sun, she closed her eyes and tried to drift like a tuft of dandelion. Her thoughts spun, though, like a maple seed, whirling round and round. The distant crunch of horse hooves on gravel opened her eyes. The rider lifted a hand. A wide-brimmed hat hid his features, but she recognized the horse, her husband’s sorrel hunter, raw-boned but with a speed she envied. Beth waved then wished she hadn’t displayed so much enthusiasm. She felt his gaze until he disappeared, following the drive around the house to the stables. Did Greville question their marriage as she did? Did he have regrets? She couldn’t ask that. Except for his once-a-week visits to her chamber, they never met alone, strangers to each other. Not for the first time she remembered the last Christmas party at her home in Sheffield. Gilbert Meaney had teased her with the suggestion that they elope. She had laughed and shaken her head. His apparent relief proved he wasn’t serious. With her mother ensconced upstairs and her grandfather in London, he’d dared to kiss her, but he hadn’t proposed again. She’d stared in horror as her fanciful dreams crashed around her. Sparky whined then began barking. He strained at the leash. Nose to sky, he tugged at the leash then began hauling back, straining away from her. Beth knelt, trying to soothe him, but he bounded to the length of his leash. He continued to strain, planting his feet and scrabbling at the pavers. The barking stopped, replaced by a low growl she’d never heard before. He lunged. The leash caught him. Like a rampant lion on a shield, he pawed at the air. Movement caught her eye. Beth stepped toward the little dog and towed on the leash, but she glanced at the glass doors that gave access to the side rooms. A dark shape moved behind the glass panes. The sun’s glare kept her from seeing more than shape. The terrier gave a mighty lunge. The ribbon leash broke, and he plunged into the grass. Beth sprang after him. She had to catch him before he dug up more of Mr. Potts’ plants. A crash shook the ground. Stone fragments peppered her. Rubble and dirt with bright red geraniums and their green petals lay scattered over the pavers. The mass of dirt covered the stone slab where she’d stood. Something whined and pressed against her leg. Sparky whined and pawed at her skirt. She scooped him up and hugged him close. He had barked and fought the leash, trying to get her to move. How had he known the urn would fall? Had he seen it teetering? He wriggled and wanted to escape her arms. Eyes still on the urn that would have killed her, Beth set him down but grabbed the much-shortened leash. The fall had destroyed the bright flowers and the urn’s graceful shape. She looked up, but the bright sun blinded her. How had the urn fallen? The Key with Spies ~ available Here. The ink is not quite dry on M.A. 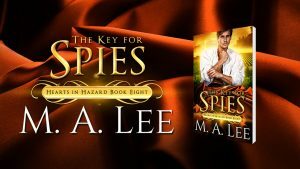 Lee’s newest book, The Key with Hearts. Here’s the link to the Amazon sale page. When KWH goes “live”, it will be available exclusively at Amazon. Regency England. Suspense. Murder. Two hearts at odds. Married for money, not for love. A convenient marriage inconveniently causes murder. Six months ago, Beth Corbett married Greville Myers. Her money saved his estate. His nobility raised her station. The couple have achieved an uneasy relationship, tepid and uncomfortable. Then Beth is nearly killed in a failed attempt at murder. *The woman who had expected to marry Greville? *The mother-in-law who hates her? *Or her husband, so he can keep her money and marry the woman he loves? When the murderer strikes again and injures someone by mistake, how can Beth discover the truth? Or will she be the next victim? 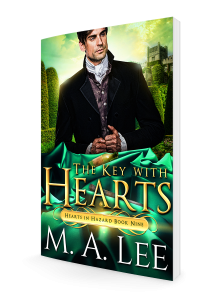 The Key with Hearts is set in Regency England. At 59,000 words, the novel is Book 9 in the Hearts in Hazard series of romantic mystery and suspense by M. A. Lee. Visit the series page or M.A. Lee’s author page for a complete list of the Hearts in Hazard books. For more on books by M.A. Lee, visit www.writersinkbooks.com .